Good morning! 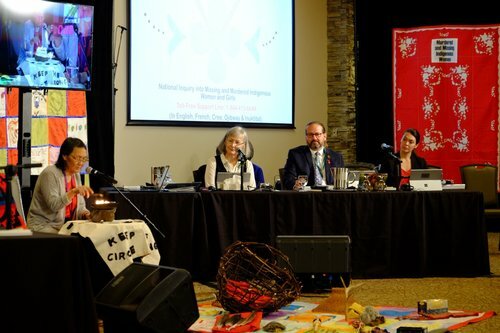 The federal inquiry into missing and murdered Indigenous women and girls is here in Iqaluit for four days of hearings on colonial violence. My name's Garrett Hinchey, and I'll be keeping you up to date in this live blog. Opening ceremonies are underway at the moment. 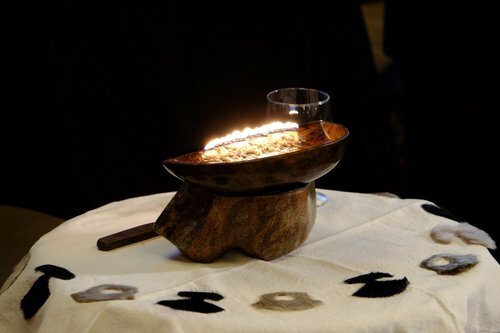 A traditional qulliq, or Inuit oil lamp, was lit, and local dignitaries are being introduced now. 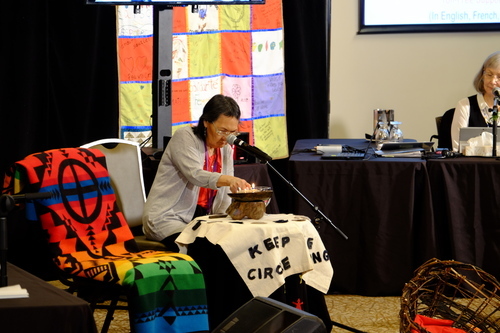 Elder Louise Hauli lights the qulliq in front of the commissioners. Sileema Angoyuak, president of the Qulliit Nunavut Status of Women Council, is being introduced to give opening remarks. Angoyuak gets emotional as she makes her remarks: "We honour our past and present generations who have worked hard to get to this point. A time of change, a time of helping ourselves. This can heal us, one way or another." The commissioners are now being introduced. Three commissioners: Brian Eyolfson, Qajaq Robinson, and chief commissioner Marion Buller have made the trip to Iqaluit. Commissioner Qajaq Robinson, who is from Igloolik, Nunavut, and grew up in Iqaluit, is now addressing the room in Inuktitut. "The commission is here this week to listen, and after the hearing, your words will become living. Not just a document, but it'll become something where we take action." Commissioner Qajaq Robinson addresses the room. Robinson: "To understand the importance of hte panel this week you need to understand the history of Iqaluit. From the establishment of the Hudson’s Bay building on the shores of Apex, to the establishment of the DEW line site and the American bases. For too long, Inuit have been an afterthought on what happens on this land." Robinson speaks about how tremendous change can come within a single generation, using Nunavut as an example: from the Cold War era to today's public government heavily impacted by Inuit land claims and self-government. Chief Commissioner Marion Buller will be next to address the room. 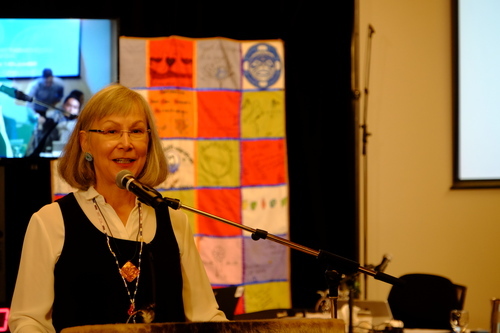 Buller: "Every day... the commissioners and I remember the spirits of missing and murdered Indigenous women and girls across Canada." 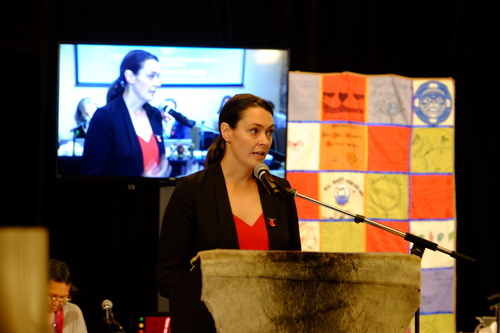 Buller says she visited Iqaluit's Angel Street yesterday to honour the spirits of those lost, got the chance to walk on the tundra and take in the surroundings. Buller thanks those present before the hearings begin. We are now in a short break before the first testimony of the week starts. We're back. The first panel of the week is focused on Inuit perspectives. Elisappe Davidee Anigmiuq, Hagar Idlout Sudlovenick, and Inukshuk Aksalnik are expected to testify. 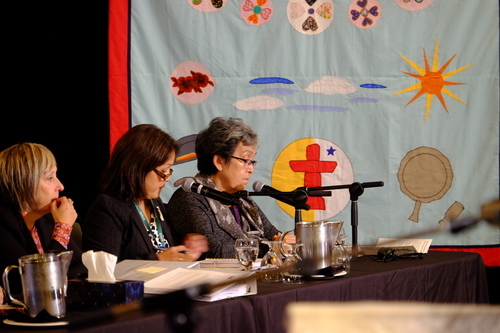 Elisapee Davidee Anigmiuq - on right, flanked by counsel - will be the first to testify today. Davidee works for Tikisigiarvik Aningmiuq, which offers programs related to cultural revitalization and knowledge sharing. She's been a director of the Nunavut Law Foundation and has won the Polar Medal. Davidee begins, in Inuktitut, by speaking about the dramatic change she's seen within her lifetime. "I remember in our camp, when I first saw an airplane, it was very scary to me. I had to hide behind my mother. That was the very first time I was scared." Davidee speaks about school, where she was made to learn English. She speaks about being asked to draw a tree without ever having seen one. "What is it? It’s very confusing to me." 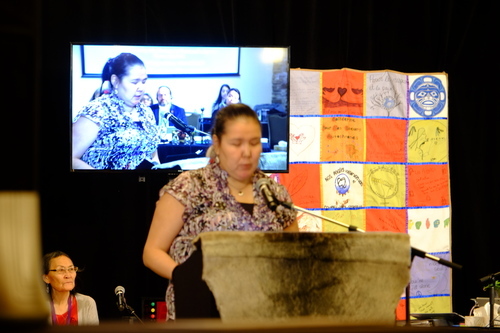 Davidee speaks of a catholic priest who said of her classmates "yes, they are Inuit, but they don't know how to make kamiks (traditional footwear)." Speaks of being forced to live between two worlds, and many people lost their culture. However, she says that some, using herself as an example, are able to live in both worlds, using traditional and modern knowledge. Davidee speaks about getting a job years ago at CBC as an Inuktitut language host. "I wish that catholic priest could see me then." Elisappe is asked to elaborate on her work at Tukisiarvik. She says she began developing proposals decades ago when she realized there were no programs to get women and children on the land. Davidee says her work is aimed at helping build self esteem and allow people to feel confident in their traditional identity - and how her experience of being told she didn't know how to make kamiks by the priest was a turning point that informed her work. She says she didn't want anyone else to feel that feeling. "I am proud to say that with our programs we have hundreds and hundreds of ladies who know how to make kamiks." Davidee is now being asked about what she had to overcome to get to where she is today. "Of all the suppression, of all the lies that I believed about myself, I did live a very healthy lifestyle. I thought I did, but when I look back, I could have done a lot better." Davidee says when she had children at home, she would only allow them to speak Inuktitut and would scold them "in a very unhealthy way" if they spoke English. With tears in her eyes, she apologizes to her children. "I didn't know where that was coming from until so many years later." She says that years later, she realized it was her revenge against her schooling, and those telling her not to speak her own language: "it was me that was angry. It was stuff that was coming out from the deepest part of me. The deepest part of me that was damaged." A little levity: "some good came out of that. My children, they all know how to speak Inuktitut," she says with a laugh. Talks about how at a conference years ago, she began feeling very angry towards a facilitator, and realized that they were her old feelings bubbling up. "I said: 'Mark [the facilitator], I'm prejudiced towards white people,'" she said. After coming to that realization, she says she was able to begin her healing journey. She now allows people to speak English in her home. Davidee is asked about how her work impacts non-Inuit in the community, and the importance of cultural sensitivity. Davidee speaks about the importance of working together and teaching cultural practice to anyone - Inuit and non-Inuit - who is willing to learn. She also speaks of the importance of funding for cultural programs. "If there was someone [controlling funding] against Inuit culture, we wouldn't be here." "We are all equal," she says in Inuktitut. "We all sleep, we all cry, we are all humans. Our cultures are different. But we can work together as a team." The commissioners are asked if they have any questions for Davidee. Commissioner Buller says they will defer questions until after cross-examination. That concludes Davidee's testimony. We will now take a short break before the second witness testifies. A quick rundown on the format of this week's hearings. This is the first of 3 panels, which will take up the entire four days. Each panel will begin with testimony from the witnesses. The parties with standing - groups from across Canada with "a substantial and direct interest in the subject matter of the National Inquiry" - will then submit questions to the witnesses for cross examination. After that, the commissioners will ask questions to end the panel. The communications staffer here told us that she believes 18 parties with standing have made the trip to Iqaluit. Each panel is expected to take approximately a day and a half. We're back from break. Inukshuk Aksalnik, the Qikiqtani Truth Commission Coordinator, is next to testify.